A night scene shows the arched path of faint light from the winter Milky Way above the landscape of Pulo do Lobo, a waterfall at the Dark Sky Alqueva Reserve near Mértola, Portugal. Miguel Claro is a professional photographer, author and science communicator based in Lisbon, Portugal, who creates spectacular images of the night sky. 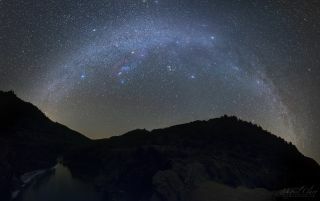 As a European Southern Observatory photo ambassador, a member of The World At Night and the official astrophotographer of the Dark Sky Alqueva Reserve, he specializes in astronomical skyscapes that connect Earth and the night sky. Join him here as he takes us through his photograph "The Faint Arch of the Winter Milky Way above Pulo do Lobo." A night scene captured from Pulo do Lobo, a waterfall located in the Dark Sky Alqueva Reserve near Mértola, Portugal, shows the arc of the winter Milky Way sprinkled with stars and other deep-sky objects that glow in shades of red, violet and blue. Directly above Barnard's Loop, you can see the red hydrogen-alpha emission from the Rosette Nebula. In the center of the image is a star cluster known as the Hyades. This is the closest star cluster to our solar system. Close to its right is another star cluster, known as the Pleiades, or the Seven Sisters — a small group of bright, bluish stars. Immediately above the Pleiades, we can find the California Nebula, a red-emission nebula like the Heart and Soul nebulas, which are located farther to the right following the path of light of the Milky Way arm. This night-sky portrait shows the path of faint light from the winter Milky Way and other deep-sky objects above Pulo do Lobo, a small waterfall at the Dark Sky Alqueva Reserve near Mértola, Portugal. Pulo do Lobo (which translates to "Wolf's Leap") is the most dramatic stretch of the Guadiana River, located about 11 miles (18 kilometers) north of Mértola. Here, the Guadiana riverbed is reduced to a narrow strait of a few meters wide, followed by a small waterfall about 13 feet (4 meters) high. The river's margins at this site are tall and stony. Legend has it that "only a brave man or a wild animal when chased could leap over this gorge," according to visitportugal.com.